Background: Nilotinib is a potent and selective BCR-ABL inhibitor approved for use in patients with newly diagnosed chronic myeloid leukemia (CML) in chronic phase (CML-CP) and in patients with CML-CP and accelerated phase (CML-AP) who are resistant to or intolerant of imatinib. Patients with imatinib-resistant CML, nilotinib treatment resulted in a significant proportion of patients achieving hematologic and cytogenetic responses in all phases of CML. Objectives: The aim of the present study was to assess the treatment outcomes in term of the molecular response rate of CML patients using Nilotinib as the second-line therapy after failure of imatinib therapy. Patients and Methods: A prospective study conducted between December 2014 and December 2016 in Baghdad Teaching Hospital and National Centre of hematology. A total of 100 patients, who were on nilotinib therapy as the second-line therapy, were enrolled in this study. The molecular response was assessed using real-time quantitative polymerase chain reaction (RQ-PCR). Major molecular response (MMR) was defined as the BCR-ABL1 of <0.1% by RQ-PCR. Results: The median age was 39 years, 59 were female and 41 were male. Fifty-three patients were classified as high-risk group, and 47 patients were as low risk. The BCR-ABL transcription level had a significant reduction from baseline at 3 months (P = 0.035) and the reduction from 3 months to 6 months was also statistically significant (P < 0.001). Comparing the patients who achieved MMR versus NO MMR, there was a significant association between low European Treatment and Outcome Study score and achieving MMR. An estimated 24 months overall survival (OS) is 95%. Conclusion: This study concluded that nilotinib is an effective therapeutic option for patients with CML-CP-resistant to imatinib therapy. Nilotinib treatment resulted in a high-OS rate and was well tolerated. The diagnostic criteria for CML according to the World Health Organization (WHO) require the detection of the Ph chromosome or its products, the BCR-ABL1 fusion mRNA and the BCR-ABL1 protein. This can be done by either conventional cytogenetic analysis (karyotyping), fluorescence in situ hybridization technique, or by reverse transcription polymerase chain reaction. In 2011, the European Treatment and Outcome Study score (EUTOS score) was developed based only on the percentage of basophils in the blood and on spleen size and its predictive value was confirmed in a validation study of 2060 patients enrolled in studies of first-line treatment with imatinib-based regimens. In this study, EUTOS score was better than Sokal and Hasford score in predicting the probability of achieving complete cytogenetic response (CCyR) at 18 months and 5-year progression-free survival., Monotherapy with a TKI that targets the ABL1 kinase is currently considered as standard treatment for CML-CP and AP. Imatinib mesylate has significantly improved the outcome of patients with CML in chronic-phase (CML-CP). In spite of the success of imatinib in treating patients with CML-CP, 34% of patients randomly assigned to the imatinib arm in resistance intervention after stroke trial was no longer on study drug at 6 years, for reasons that included lack of efficacy (12%) and the occurrence of adverse events (AE) (4%). Resistance can emerge through several mechanisms, including point mutations in the BCR-ABL kinase domain. For patients resistant or intolerant to imatinib, second-generation tyrosine kinase inhibitors which is more potent than imatinib. In addition to selectively inhibit BCR–ABL mutation, it also inhibits PDGFR and c-kit. It is also active against a range of imatinib-resistant kinase domain mutations, except for T315I, F359V/C, E255K/V, and Y253H/F. Monitoring response to TKI therapy is one of the key management strategies of CML. Response to TKI therapy is determined by the measurement of hematological, cytogenetic, and molecular responses. The goal of TKI therapy is to achieve a major molecular response (MMR) (define as BCR-ABL1 <0.1%) within 12 months of initiation of therapy to prevent disease progression to accelerated or blast phase according to ELN guidelines. The main objective of this study, open-label was to determine the efficacy of nilotinib in patients with PhÞ CML patients in accelerated phase who are resistant or intolerant to imatinib therapy. This prospective cohort study conducted on 100 Iraqi CML patients, it was done in Baghdad Teaching Hospital and National Central of hematology in Baghdad, from December 2014 to December 2016. Eligibility criteria for inclusion of patients were as follows: patients with CML-CP who were 18 years of age and more if they had imatinib resistance or intolerance, good performance status (the WHO Performance Score 1), and normal hepatic, renal, and cardiac functions. Resistance was defined as no complete hematological response (CHR) at or after 3 months; no minimal cytogenetic response by 6 months; no major cytogenetic response (McyR) by 12 months; loss of CHR; loss of minor cytogenetic response; loss of MCyR or CCyR; or the development of clonal evolution. Imatinib intolerance was defined as discontinuation due to a Grade 3/4 imatinib-related AE. This study was conducted by the Declaration of Helsinki, and all patients gave their written informed consent according to institutional guidelines. The protocol was reviewed and approved by an Institutional Review Ethical Committee at each participating center. Patients are given nilotinib at a dose of 400 mg twice daily (800 mg/d) and they were followed for survival. The primary objective of the study was to determine the incidence of MMRs in patients resistant or intolerant to imatinib. This is the best cumulative response, with molecular assessments performed at 3, 6, and 12 months and then every 6 months in the 1st year and every 3–6 months in subsequent years. The secondary objectives were to determine the overall survival (OS) which was calculated from the start of nilotinib to death due to any cause, as well as to determine the safety profile of nilotinib. Duration of response was defined as the time from the start of the response to the date of discontinuation due to progression or death. Calculation of the EUTOS score done by counting the basophil percentage in peripheral blood along with splenic size in cm as in following formula (7 × basophils + 4 × spleen size); therefore, a score of more than 87 is considered to be high risk, while score ≥87 consider being low risk. All time-to-event analyses were performed with the use of Kaplan–Meier methods and presented by Kaplan-Meier curves SPSS 20.0.0 (Chicago, IL) Minitab 17.1.0 software packages were used for statistical analysis and a P < 0.05 was considered indicative of statistically significant difference. The study group included 100 patients, mean age of patients at diagnosis was 39.1 ± 11.5 years, and female-to-male ratio was 1.4:1. Forty-seven patients were considered as low-risk group according to the EUTOS score, and 53 patients as high-risk group. Median duration before receiving nilotinib was 42 months. Patients had either primary failure (17%) or loss of MMR (83%), they were offered nilotinib therapy 400 mg twice daily. At the end of follow-up, 5% of the patients had died, of them, 3 had blast transformation, time to achieve MMR has a median of 9 months [Table 1]. The BCR-ABL transcription level had a significant reduction from baseline at 3 months (P = 0.035) and the reduction from 3 months to 6 months was also statistically significant (P < 0.001) as illustrated in [Figure 1]. Comparing the patients who achieved MMR versus No MMR, there was a significant association between low EUTOS score and achieving MMR [Table 2]. The estimated mean OS of CML patient since starting nilotinib using Kaplan Meier survival formula was 82.9 months; however, patients with low risk (using the EUTOS score) had better survival of 92.2 months, while those with high risk had shorter duration of survival of 58.3 months, despite this differences in survival it was not statistically significant (hazard ratio = 4.996, 95% confidence interval [CI]: 0.529–47.216). Patients achieving MMR had significantly longer cumulative survival THAN those who did not achieve MMR (93.1 versus 56.5 months, respectively), the hazard ratio of 9.320 (95% CI: 1.037–83.738) [Table 3] and [Figure 2] and [Figure 3]. All adverse effects hematological and nonhematological were either grade 1 or 2 as follows: Skin rash occurred in 14% of patients, joint pain 5%, palpitation 5%, anemia 4%, leukopenia 3%, headache 3%, thrombocytopenia 2%, hair loss 2%, Jaundice 2%, and 1% for each of the following: generalized edema, peripheral arterial obstruction, and peripheral neuropathy. 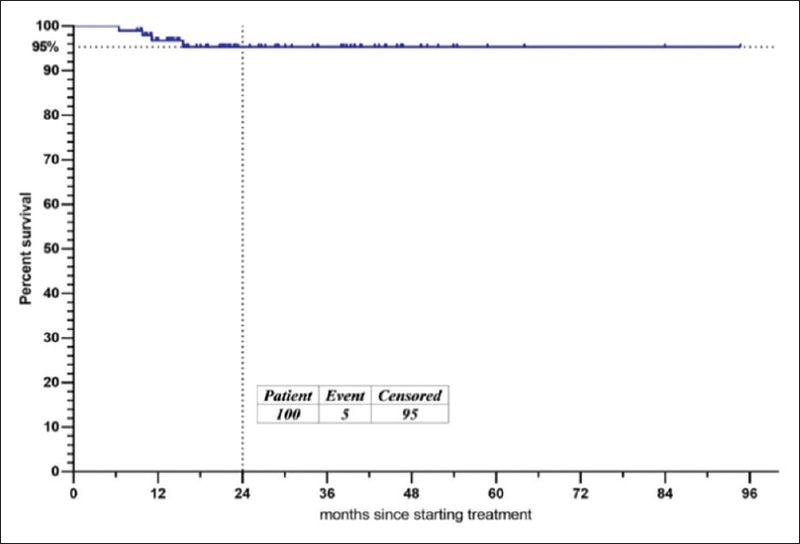 This study showed that nilotinib treatment was effective in CML patients after imatinib failure, in which 67% of the patients achieve MMR and an estimated 24 months OS of 95%. The result of this study was higher when compared to that of Ayala et al., in which Nilotinib-induced CCyR was in 60%, and he found that molecular responses were 48% in the 110 patients treated, 58% of whom were MMRs, and 42% were deep molecular response. In TIDEL-II trial, CML patients were enrolled in two sequential cohorts in which they initially started on imatinib 600 mg/day then either escalated to 800 mg/day imatinib or nilotinib 800 mg/day, for the nilotinib cohort 87% and 83% of the patients achieved MMR after 12 and 24 months, 22% and 33% achieved MR4.5 after 12 and 24 months, respectively, compared to our findings TIDEL-II showed higher MMR. The results of this study differs from that reported by Kantarjian et al., in which MMR was achieved in 28% of the patients (294 patients had BCR-ABL transcript levels available during follow-up), they reported that patients at baseline with CHR had 38% MMR at the end while 22% had MMR in those without CHR, after 12 and 18 months 32% and 39% achieved MMR, respectively. 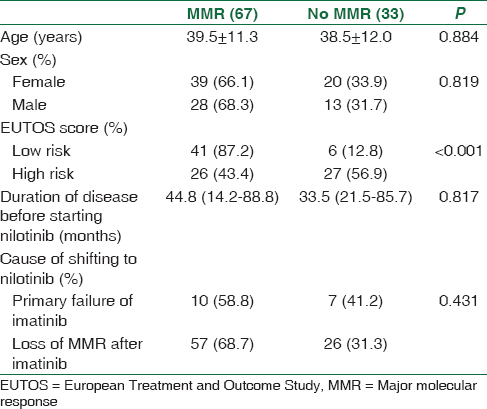 The results of this study showed that the only significant predictor of MMR was the EUTOS score, in which low EUTOS associated with achieving MMR, this was similar to Larson et al., in which MMR rate was higher in lower risk group in both nilotinib and imatinib groups however that study utilized Sokal score but it satisfied the same conclusion reached by the EUTOS score. Switching from imatinib to nilotinib in <2 years, predicted lower cumulative survival after nilotinib therapy (22.2 ± 0.6 months) compared to 86.4 ± 7.2 months for those who had more than 2 years of imatinib therapy, indicating that rapid imatinib resistance leads to poor outcome even after conversion to the second-line therapy. 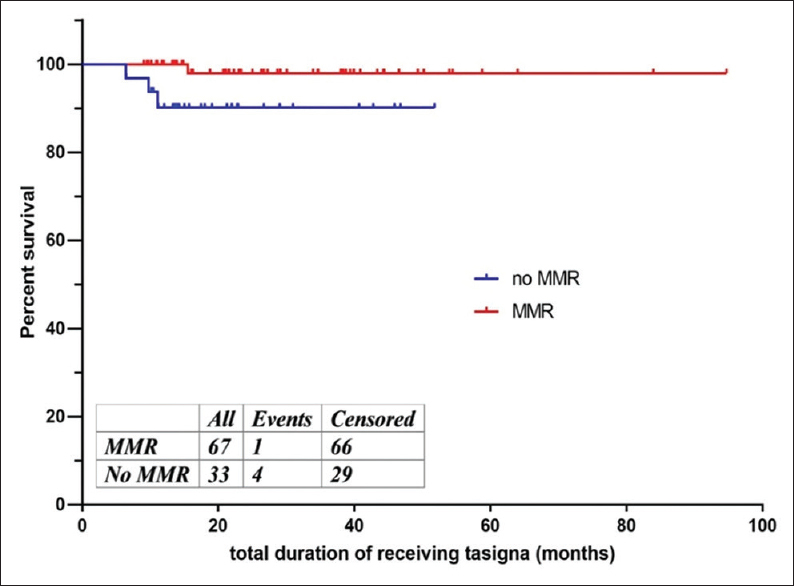 Achieving MMR is a significant predictor of longer OS in which patients achieving MMR had mean cumulative survival of 93.1 ± 1.6 months compared to 56.5 ± 3.2 for those without MMR, this result is similar to TIDEL-II trail. 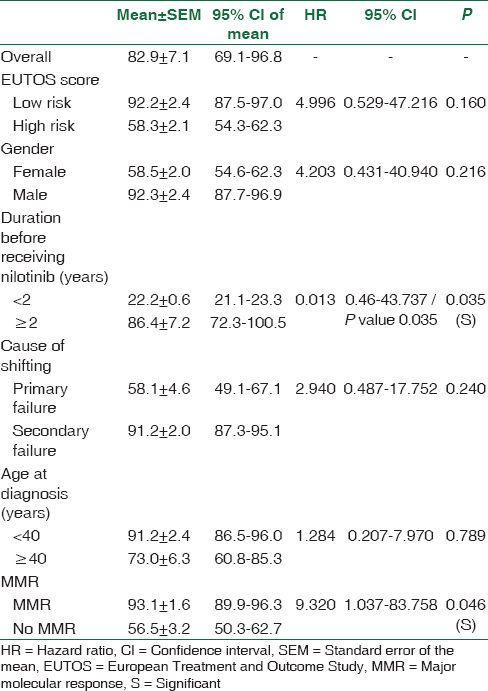 Primary failure of imatinib lead to shorter OS (58.1 ± 4.6 months) compared to secondary loss of MMR (91.2 ± 2.0 months). Consistent with prior studies,,, this analysis showed the importance of the early molecular response to Nilotinib treatment. 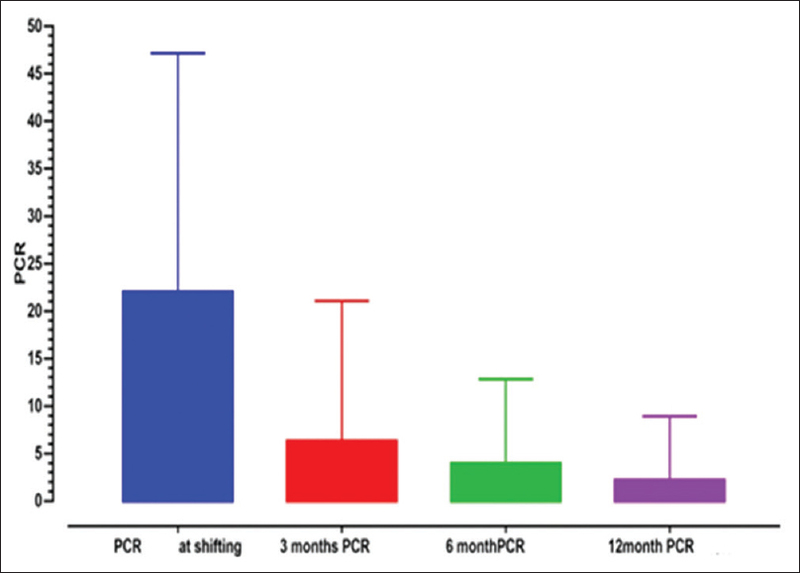 Patients with BCR-ABL1 10% at 3 months achieved the highest rates of response at later time points, whereas 10 out of 25 (40%) patient with BCR-ABL1 >10% at 3 months achieved MMR by 12 months compared with 57 out of 75 (76%) patients with BCR-ABL <10% at 3 month achieved MMR by 12 month. Five patients died in this study, 3 of them due to progression to documented blast crisis. The rate of blast phase was 2.1% (at 400 mg twice daily) in efficacy and safety in clinical trials-newly diagnosed patients (ENESTnd) study versus 3% in this study. The death rate from any cause was 3.5% (at 400 mg twice daily) in ENESTnd versus 5% in this study. This study confirms that nilotinib is an effective therapeutic option for patients with CML-CP resistant to imatinib therapy. Nilotinib treatment resulted in a high OS rate and was well tolerated. Rumpold H, Webersinke G. Molecular pathogenesis of Philadelphia-positive chronic myeloid leukemia – Is it all BCR-ABL? Curr Cancer Drug Targets 2011;11:3-19. Alwan AF. Assessment of cytogenetic response after treatment with imatinib mesylate in patients with chronic phase chronic myeloid leukemia. Iraqi J Hematol 2014;3:56-61. Marin D, Ibrahim AR, Goldman JM. European treatment and outcome study (EUTOS) score for chronic myeloid leukemia still requires more confirmation. J Clin Oncol 2011;29:3944-5. Jabbour E, Cortes J, Nazha A, O'Brien S, Quintas-Cardama A, Pierce S, et al. EUTOS score is not predictive for survival and outcome in patients with early chronic phase chronic myeloid leukemia treated with tyrosine kinase inhibitors: A single institution experience. Blood 2012;119:4524-6. Saglio G, Hochhaus A, Hughes TP, Clark ER, Nakamae H, Kim DW, et al. ENESTnd update: Nilotinib vs. imatinib in pateints with newly diagnosed chronic myeloid leukemia in chronic phase and the impact of early molecular response and Sokal risk at diagnosis on long-term outcomes. Blood 2013;122:92. Hochhaus A, O'Brien SG, Guilhot F, Druker BJ, Branford S, Foroni L, et al. Six-year follow-up of patients receiving imatinib for the first-line treatment of chronic myeloid leukemia. Leukemia 2009;23:1054-61. Gorre ME, Mohammed M, Ellwood K, Hsu N, Paquette R, Rao PN, et al. Clinical resistance to STI-571 cancer therapy caused by BCR-ABL gene mutation or amplification. Science 2001;293:876-80. Weisberg E, Manley P, Mestan J, Cowan-Jacob S, Ray A, Griffin JD, et al. AMN107 (nilotinib): A novel and selective inhibitor of BCR-ABL. Br J Cancer 2006;94:1765-9. Baccarani M, Deininger MW, Rosti G, Hochhaus A, Soverini S, Apperley JF. Myeloproliferative neoplasms. In: Swerdlow SH, Campo E, Harris NL, Jaffe ES, Pileri SA, Stein H, et al., editors. Lyon: WHO Press; 2008. p. 31-65. Ayala M, Domínguez J, Chavez A. Nilotinib as second or third-line therapy for myeloid chronic leukemia chronic-phase in Mexican patients. Blood 2016;128:5459. Yeung DT, Osborn MP, White DL, Branford S, Braley J, Herschtal A, et al. TIDEL-II:First-line use of imatinib in CML with early switch to nilotinib for failure to achieve time-dependent molecular targets. Blood 2015;125:915-23. Almothaffar AM, Yassin BA, Murad NS, Alameri AM. Survival of patients with CML on imatinib experience with 44 Iraqi patients. J Fac Med Baghdad 2008;50:286-95. Rahem RM, Alaawad AS, Kamoona TH. Evaluation of molecular monitoring and response milestone of patients with chronic myeloid leukemia to tyrosine kinase inhibitors in Middle Euphrates of Iraq. Iraqi J Hematol 2016;5:143-8. Larson RA, Kim D, Issaragrilsil S, le Coutre P, Dorlhiac Llacer PE, Etienne G, et al. 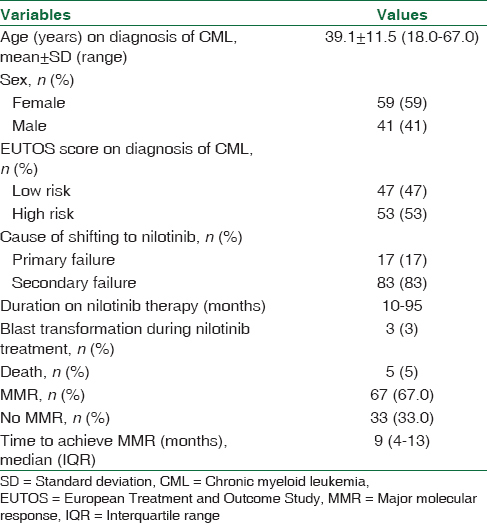 Efficacy and safety of nilotinib (NIL) vs. imatinib (IM) in patients (pts) with newly diagnosed chronic myeloid leukemia in chronic phase (CML-CP): Long-term follow-up (f/u) of ENESTnd. Blood 2014;124:4541. Giles FJ, Mauro MJ, Hong F, Ortmann CE, McNeill C, Woodman RC, et al. Rates of peripheral arterial occlusive disease in patients with chronic myeloid leukemia in the chronic phase treated with imatinib, nilotinib, or non-tyrosine kinase therapy: A retrospective cohort analysis. Leukemia 2013;27:1310-5. Kim TD, Rea D, Schwarz M, Grille P, Nicolini FE, Rosti G, et al. Peripheral artery occlusive disease in chronic phase chronic myeloid leukemia patients treated with nilotinib or imatinib. Leukemia 2013;27:1316-21. Hanfstein B, Müller MC, Hehlmann R, Erben P, Lauseker M, Fabarius A, et al. Early molecular and cytogenetic response is predictive for long-term progression-free and overall survival in chronic myeloid leukemia (CML). Leukemia 2012;26:2096-102. Marin D, Ibrahim AR, Lucas C, Gerrard G, Wang L, Szydlo RM, et al. Assessment of BCR-ABL1 transcript levels at 3 months is the only requirement for predicting outcome for patients with chronic myeloid leukemia treated with tyrosine kinase inhibitors. J Clin Oncol 2012;30:232-8. Jabbour E, Kantarjian HM, Saglio G, Steegmann JL, Shah NP, Boqué C, et al. Early response with dasatinib or imatinib in chronic myeloid leukemia: 3-year follow-up from a randomized phase 3 trial (DASISION). Blood 2014;123:494-500.